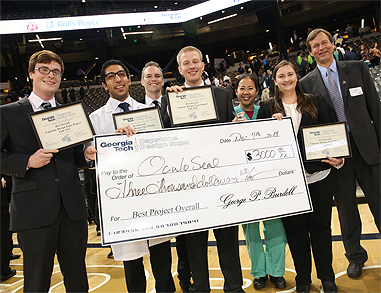 With a project offering a new way to fix drooping eyelids, OculoSeal — a team of biomedical engineering majors — won the top prize at the Fall 2014 Capstone Design Expo. Health was a common theme among the winning concepts, drawn from the 105 teams competing in the expo. Georgia Tech’s Capstone Design Expo is an extravaganza of technology, prototypes, and ingenious solutions. See all the highlights of the Fall 2014 Expo. 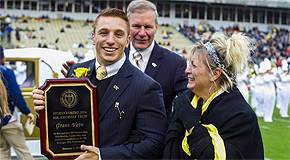 Mechanical engineering student Grant Veve was named Mr. Georgia Tech at the Homecoming football game Saturday, after a clever campaign video went viral on the Internet. Every year, a Mr. and Ms. Georgia Tech are elected by the students based on their academics and involvement around Tech’s campus. You Can Do That (In China)! 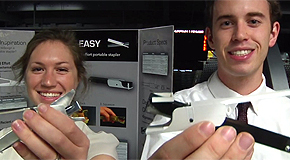 In 2013, Georgia Tech mechanical engineering major Nick Selby gave a speech that would become one of the most talked about video clips of 2013. 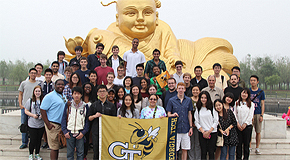 Nearly a year after, inspiring a new class of Yellow Jacket freshmen to “build the Iron Man suit,” Selby found himself posing next to a life size statue of that very suit – across the world in China. The holiday season provides us with a chance to reflect upon the many accomplishments of Woodruff School students, faculty, staff and alumni in 2014. We enjoyed a spectacular year thanks to the efforts of thousands of dedicated individuals and hundreds of teams of folks dedicated to providing our students with the best education and in seeking solutions to the world’s grand challenges.